Back in 2005 when I attended my first (and only) face-to-face WCAG Working Group event in Seattle we couldn’t even comprehend where technology would be today; with the array of smartphones, tablets, laptops and smartwatches to come. Nevertheless, we were very focused on making the second version of the Web Content Accessibility Guidelines ‘technology neutral’; so that it would still be applicable to any of the myriad of future technologies available now. In some cases, we were successful, but when it comes to mobile accessibility, unfortunately, we were not. The W3C has released a discussion paper on Mobile and accessibility and how it relates to WCAG2. It is a good read, but it doesn’t provide any implementation criteria. It does list WCAG2 Techniques that apply to mobile, but there is no information on how they apply to mobile, and there aren’t any additional techniques that are specific only to mobile. At AccessibilityOz, we started testing mobile-only sites early last year. Initially, we used the BBC Mobile Accessibility Guidelines and merged them with WCAG2 to conduct our testing. However, we quickly realised that this wasn’t enough; we found a number of things that were not covered in WCAG2 or the BBC Mobile Accessibility Guidelines and considered many of them quite serious accessibility issues. This resulted in us developing our own unique AccessibilityOz Mobile Testing Methodology which we have since used in our testing of many mobile-only and responsive websites. There are a number of ways that viewing a website (whether it is optimized for mobile or not) on a mobile device can be problematic. Here I am going to focus on hover inaccessibility. Note 1: A keyboard interface allows users to provide keystroke input to programs even if the native technology does not contain a keyboard. Example: A touchscreen PDA has a keyboard interface built into its operating system as well as a connector for external keyboards. Applications on the PDA can use the interface to obtain keyboard input either from an external keyboard or from other applications that provide simulated keyboard output, such as handwriting interpreters or speech-to-text applications with "keyboard emulation" functionality. Note 2: Operation of the application (or parts of the application) through a keyboard-operated mouse emulator, such as MouseKeys2, does not qualify as operation through a keyboard interface because operation of the program is through its pointing device interface, not through its keyboard interface. That means that a UI component that is accessible to an external keyboard on a mobile device can actually comply with WCAG2; even if it is not accessible via a mouse or via touch. WCAG2 was written this way as back in the 2000s it was incomprehensible that a website would be created that was not mouse-accessible. Keyboard accessibility had to be included in WCAG2 though as it was (and still is) quite common to find keyboard-inaccessible websites. And of course, we didn't even think of touch accessibility. However, instead of a pointing device, users only have the ability to activate components on the mobile. There is no equivalent ability to ‘hover’ over a component, as you can with the mouse or ‘focus’ on a component, as you can with the keyboard. This can cause a range of functionality problems. Dropdown or flyout menus are very popular at the moment. In many cases, you hover over the top-most menu item to reveal its sub-menu items. If that main menu item is actually a link to another page, then this hover feature can’t be replicated on a mobile device. Tapping on the main menu item will just take users to that page; there is no way to replicate the mouse hover effect on a mobile (well some mobile devices have the ability to replicate the hover effect but it certainly isn't a well-known technique). This is one reason that in order to activate the flyout menus on the AccessibilityOz website, you need to actually click on the top-most menu item. For sites that make this top menu item a link, mobile users have only one option: to activate that top menu item. This means they cannot access the dropdown or flyout menu, as touching the top menu item will activate the link – taking the user to that particular page. We can see this scenario on LinkedIn. Figure 1: Drop-down appears only on mouse hover or keyboard focus. If you access this page on a mobile device, it's impossible to activate the dropdown. Touching the ‘Profile’ top menu item takes you to the Profile page. Most people are aware of the term “keyboard trap”. It is when a keyboard user gets trapped within a particular component, such as a video player. There is often no way to exit from the keyboard trap other than closing the browser window. We have also come across what we term a "reverse keyboard trap"; where the keyboard activates a component which cannot be closed. Although the user can continue tabbing through the page, the component overlaps other content which can make the site difficult, or almost impossible, to use. We have also come across what we term a "reverse keyboard trap"; where the keyboard activates a component which cannot be closed. Although the user can continue tabbing through the page, the component overlaps other content which can make the site difficult, or almost impossible, to use. Of course, this is a serious accessibility issue – not to mention a huge UX concern – and is one of the four non-interference success criteria in WCAG2. A non-interference success criterion is a requirement that an entire site needs to meet in order to claim accessibility even for only a section of that site. 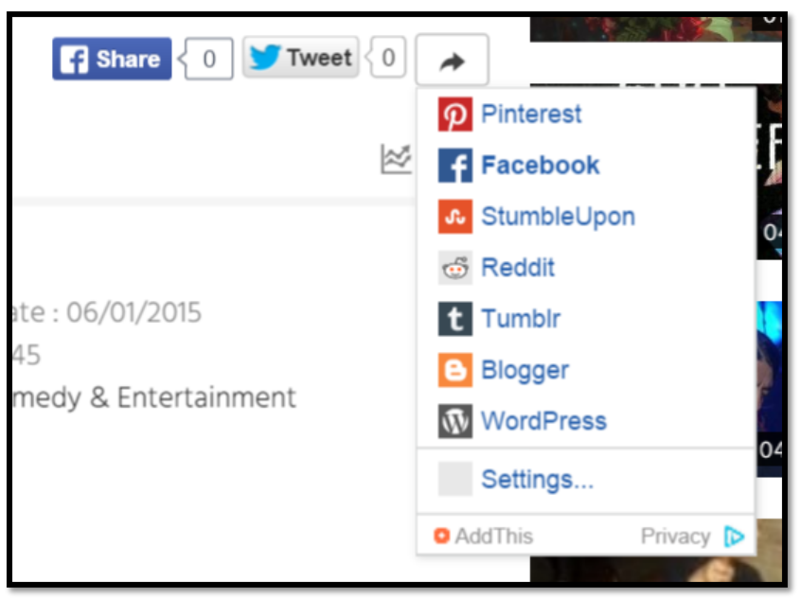 We see the 'AddThis' plugin as a keyboard trap on a lot of sites – for example, www.theage.com.au. We have also come across a different type of keyboard issue, which we call a “Keyboard Focus Trap”. When focussing on a component with the mouse, a popup or 'tooltip' appears. When moving the mouse away, this popup disappears. When activated on keyboard focus, this popup appears, but it does not disappear when keyboard focus is removed. We can see this in action on DailyMotion with the AddThis plugin. Figure 2: Popout appears on keyboard focus but does not disappear when keyboard focus is removed. Thankfully, on the DailyMotion mobile site, this Addthis functionality is withdrawn. However, we often see a similar error in mobile devices. Some sites provide additional functionality when the mouse hovers over an item, or when it has keyboard focus. The most obvious of these is the TITLE attribute that can be added to links, images and fields. The contents of the TITLE attribute appears on a tooltip on mouse hover and disappears when the mouse moves away. However, other sites take this functionality even further by providing a zoomed-in view of the site on mouse hover. 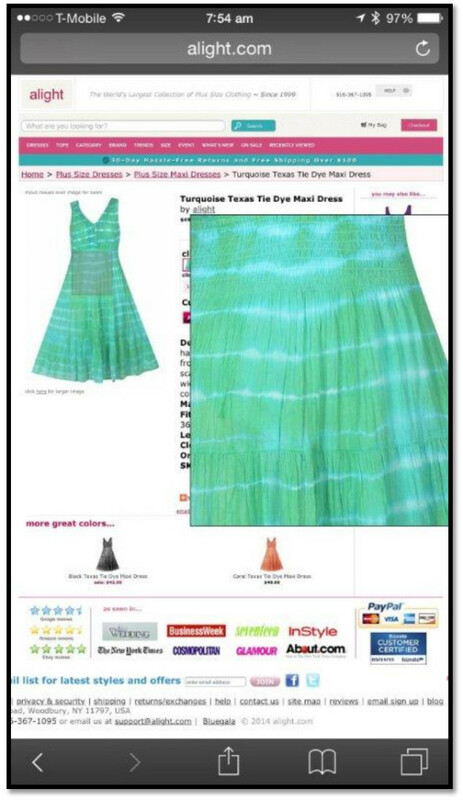 This is commonly seen on websites selling clothing – hovering over a particular item provides a zoomed-in version of the clothing so you can easily see the patterns and fabric texture. When the mouse leaves the item, the popup disappears. Often this functionality is not made available to the keyboard, but it does function on a mobile device; though, not in an accessible way. In the example below, the user has activated the popup by touching the clothing item. This popup partially obscures other content in the site. However, as the site is being viewed on a mobile device there is no way to remove that focus, as you normally would do by moving your mouse to another area in the site. The popup generally remains activated and cannot be dismissed by the user unless they close the browser entirely. We have called this a ‘mobile hover trap’. Even tapping on any other part of the screen is often not enough not close this popup. Of course, sites built specifically for mobile are unlikely to have this error, as it is well-known that the hover effect can't be replicated on mobile. These are just a couple of accessibility issues that are unique to mobile and are not covered properly in WCAG2. Although I commend the WCAG Working Group for an excellent discussion paper on mobile issues, I think that they need to go further and develop specific mobile techniques. StarTechConf in Santiago, Chile on the 6th November. 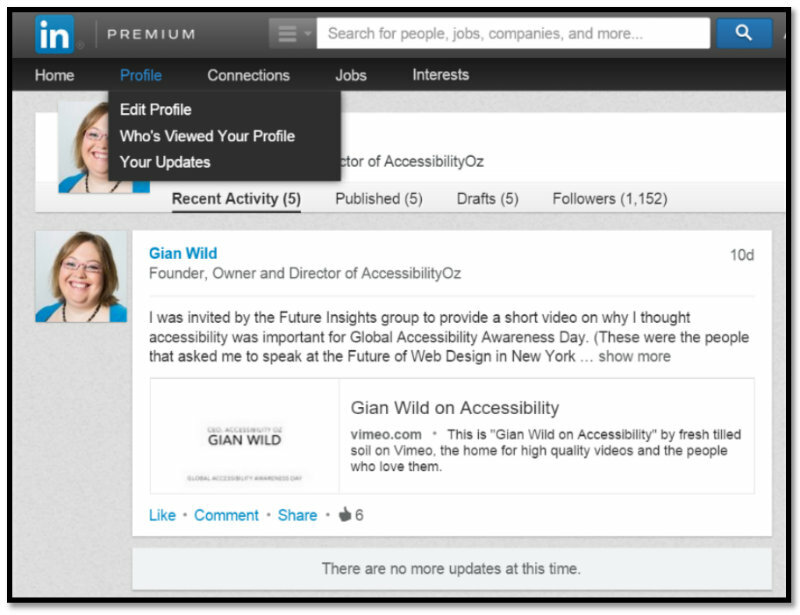 Gian Wild has been working in accessibility since 1998. She worked on the very first Australian accessible web site and was the accessibility consultant for the Melbourne 2006 Commonwealth Games. For six years she was actively involved in the W3C Web Content Accessibility Guidelines Working Group. Gian Wild is the Director of AccessibilityOz.